A one-sentence summary of Rescue Dawn might sound like Rambo or Top Gun, but it’s not the action-packed explosion-fest you might expect. There are, however, two words that describe the film well: Werner Herzog. Herzog has a brilliant career with many essential films on his filmography. Often blurring the line between drama and documentary, Herzog depicts the lives of real people with larger-than-life obsessions. For example, Fitzcarraldo is about a man who dreams of bringing opera to the South American jungle; not so easy when the riverboat can’t navigate the Amazon and has to be dragged a mile overland, over a hill. There is a parallel documentary called Burden of Dreams, which is about another crazy German (Herzog), with the same dream and same exact problems as Fitzcarraldo. Cinematographer Peter Zeitlinger and editor Joe Bini both worked with Herzog on Little Dieter Needs to Fly. The New Yorker profile from the set of Rescue Dawn. Rescue Dawn completes the second half of another drama/documentary pairing from Herzog. In 1998, he released a documentary called Little Dieter Needs to Fly, about a German-born American pilot shot down during the Vietnam War. 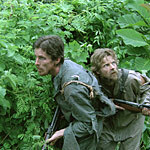 Rescue Dawn tells the same story as a drama starring Christian Bale as Dieter Dengler. The two movies make an excellent pair, and if you see them back to back, you’ll be rewarded with a score of connections. Both use some of the same stock footage, dialogue is borrowed from the interviews, and a hundred details described in the documentary are re-created in the drama. Dengler’s service in the war is nasty, brutish, and short. On his first combat mission, he is shot down over Laos. He is captured by the Viet Cong and marched to a prison camp where he spends most of a year. It’s not really a spoiler to say he lives to tell the tale. Starring with Bale are two other faces you’ll recognize from the movies. Jeremy Davies, already a slight man, is shockingly thin, with the spacey attitude to go with it. And Steve Zahn as Duane is timid, fearful, intense. There are also three other prisoners who form the core group of men held with Dengler in the prison camp. Herzog’s POW movie has bravery, cunning, and triumph, but tempered by reality. It also has simple, human love, which is something your standard action movie turns its head away from in embarrassment. It doesn’t have any of the swagger you see in The Great Escape or Rambo. The life of these prisoners is grubby, emaciated, makeshift, and filthy. Representative scenes include Duane’s embarrassment at his hopeless case of diarrhea. Chained together at night, the cellmates have to put up with the filth and the smell and the flies. Duane happens to make their nights a little less pleasant, but it could be any of them. Rations are so low that no source of protein, including insects and worms, can be refused. You didn’t see the buff cast of The Great Escape in these situations. The high points of Dengler’s captivity include stealing a single nail and knowing how to use it to open a standard pair of handcuffs; the discovery of spent shells, hammered flat and sharpened to make a tiny, thumbnail-sized knife; learning how to make fire using a single length of bamboo and a machete; and the gift of a single handful of rice from the one kind-hearted guard. The tone of Rescue Dawn is human-scale, not larger than life. That makes the escape scene toward the end truly terrifying. Dengler is a weakened, emaciated hero risking his life — not some abstract virtue, but whether the past six months will have been his last ever — for a good plan that has no guarantee of working. Herzog is best in the jungle. There are bookending scenes of “civilization,” and they play a little awkwardly. The flight instructions at the beginning of the movie is low-key compared to Top Gun. Bruckheimer must have spoiled that scene for me, because Herzog’s version feels too timid and ugly (then again, Herzog’s version is probably closer to reality than Bruckheimer’s). And Dieter’s brief return to civilization feels artificially big, like something Bruckheimer might do, although the weird thing is that it’s actually true in Dengler’s case. Thankfully, Herzog adds a few subversive touches in the triumphant scene at the end so you know it’s him. Rescue Dawn doesn’t surpass Herzog’s best work, but it is a solid, effective movie that fits nicely into to Herzog’s canon. It’s refreshing to see Bale and Zahn taking some chances on a low-budget indie from an artistic director. Too many actors would give up the chance to work with Herzog in favor of a better-paying, easier role. Though not outstanding, Rescue Dawn is a welcome addition to a summer defined by studio-produced sequels.